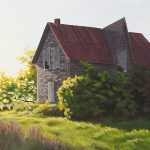 There is a column in OVAC’s magazine (Oklahoma Visual Arts Coalition) called Ekphrasis which connects the disciplines of poetry and art allowing them to inspire each other. 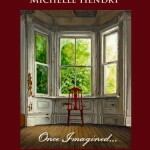 I like to believe paintings or photographs are visual poetry, but they have often inspired me to write. Like painting, there are lots of failures and mediocre works to every masterpiece. Last weekend I returned to Oklahoma for the first time since we moved away to attend the OWFI (Oklahoma Writer’s Federation) 2018 Conference. Writers, authors, agents and publishers come from all over to be a part of this Conference, including Oklahoma, Arkansas, Kansas, Texas and some as far away as San Francisco and New York. It is an impressive gathering of talent. Until recently, I primarily identified myself as a painter, however, that’s changing thanks to this amazing tribe. I have had the privilege of meeting some talented and hard working writers. I am lucky enough to call some of them friends. At last year’s Conference, I attended a session with past poet laureate of Oklahoma, Nathan Brown, that changed the way I write. The special thing about poetry that distinguishes it from most prose is sound. That isn’t a revelation. But, as a visual person, hearing it in action under the tutelage of Nathan Brown was a revelation. 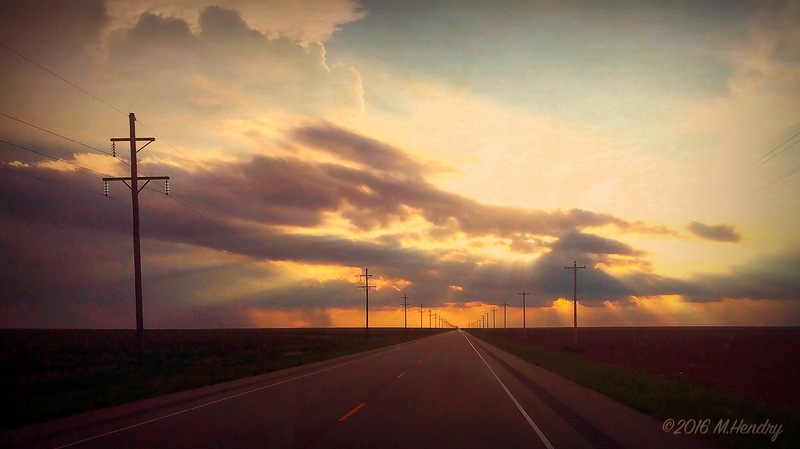 I took the advice with me through the chaos of the rest of 2017 and wrote “Road Trip to the Panhandle”, inspired by the visual cues of a photo taken out the front window of the truck on a road trip to New Mexico in 2016 (above). I edited this poem over and over, reading it aloud until it was time to enter this year’s contest. Oklahoma is known for its disproportionate number of writers and with so many great writers in this part of the country, including songwriters, the competition is fierce. During the awards ceremony at the close of the Conference, the presentation ran through the winners of the Poetry, Unrhymed Long category, a category I have entered before and never succeeded. I was shameless enough to keep writing bad poems and submitting them in the past, likely to the horror of the judges of those contests. I did this over and over again, hoping one day I’d overcome suckage. We passed the honourable mentions, the third, then second place winners. 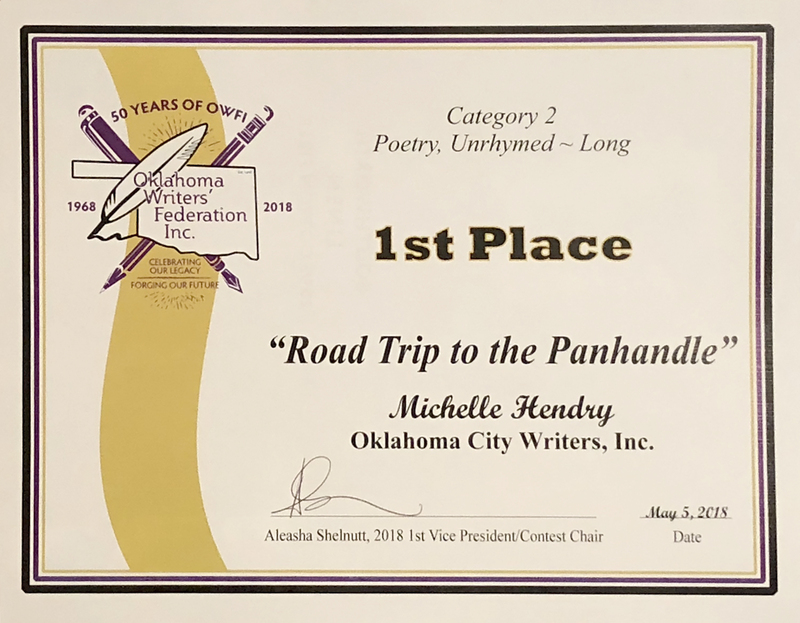 At this point, I was thinking to myself, “No chance.” I looked away from the projection screen of winning entries, digging into my purse to distract myself, when “Road Trip to the Panhandle” was announced as the first place winner. I think my jaw hit the floor and it took a few seconds to pick it up. I was barely able to stumble to the podium and collect the award. I may have forgotten to say thank you to Jim, the gentleman handing out the awards. I can’t quite remember. I was on air the rest of the evening. It didn’t matter that I didn’t even place in the other 4 categories to which I had submitted. This was the long shot! And I won! 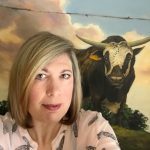 I had been thinking about Oklahoma in the weeks leading up to the Conference. 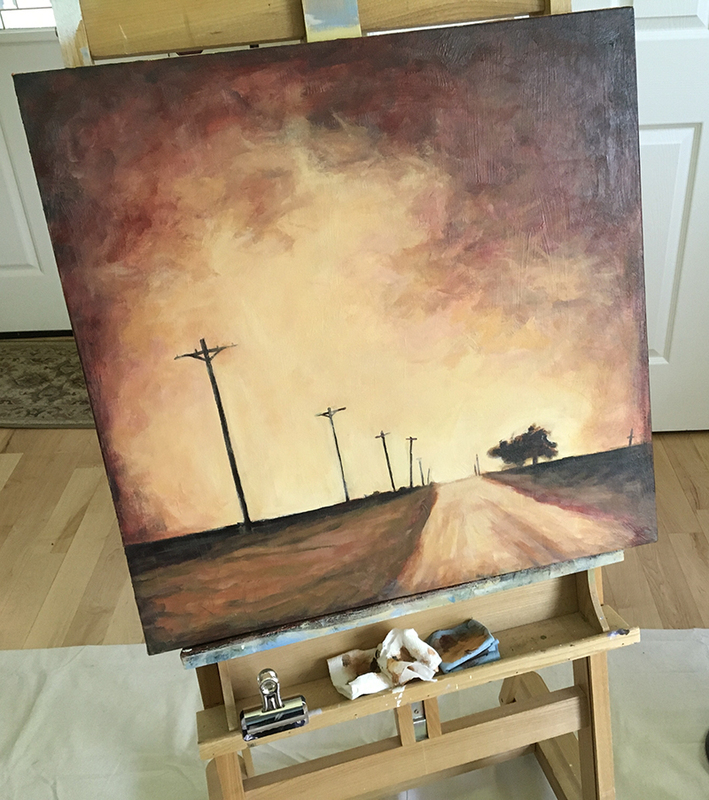 I started a painting that began with a softly coloured reference and ended up channeling the smoke from terrible wildfires that took place in western Oklahoma and the Panhandle in April. It is clear to me that Oklahoma will always occupy a place in my heart, no matter where I might find myself. Congratulations on the win, Michelle! The work in progress already looks amazing! Congratulations again Michelle on your win!!! An awesome accomplishment. Wow! Awesome, congrats, congrats, congrats! It does feel good! Thanks!